Canine land treadmills have certainly evolved from the early days, an in particular, motorized models. Many of them now offer inclines, declines, varying speeds, and other safety features. 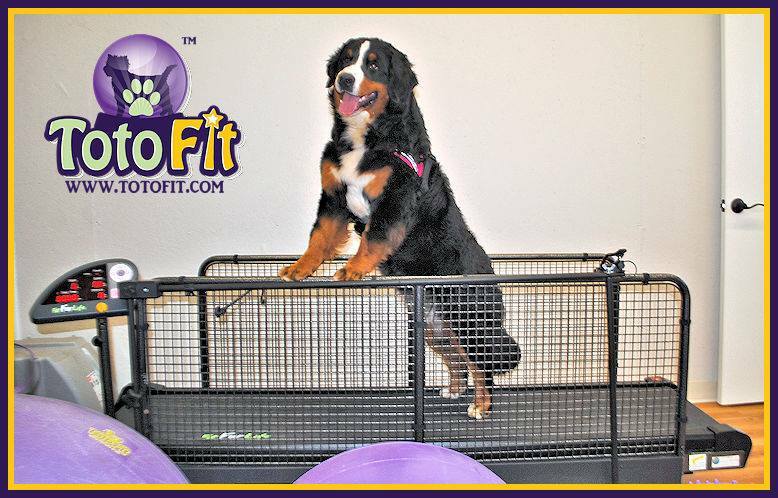 Treadmills were designed as a way to improve a dog’s endurance, strength, range of motion, and activity level. When we look at the goals of a treadmill – walking or trotting for various reasons – it is a rather simple technique. My favorite method of endurance is always walking or hiking outside. However, there are many reasons why this is not always possible, often weather related. So a land treadmill is definitely a great option. First and foremost, safety is the key. Can every dog walk on a treadmill – no. Some people cannot walk and chew gum at the same time, and some dogs cannot put this coordination together either. A proper introduction to the treadmill is always important. I find that beginning with the treadmill on first while the dog is in the room assists with any noise sensitivities. I will turn the treadmill on, and spend some time with the dog in another corner of the room rewarding and positively praising. I will then stop the treadmill and allow the dog to explore it on their own. Placing low calorie treats on the treadmill, allowing the dog to explore the treadmill is a great introduction. Once the dog is confident with both the noise and feel of the treadmill, I will begin them on it. I always recommend a properly fitting harness for the dog with any conditioning activity and it is paramount here to control the dog and prevent injury. I like to start the treadmill off slowly and as soon as the dog is on it. The less time they have to think about things the better. I find the faster I increase the speed to their normal walking speed, the easier it is for the dog. For example, most dogs walk at a pace between 2 and 4 mph. Unless the dog is arthritic or recovering from an injury, or surgery, this is appropriate for the majority of dogs. Of course, if the dog requires a slower speed, then begin with that. If I am going to reward the dog for getting on the treadmill, I will treat them. However, I do not recommend continuous treats while walking. This is very unnatural – we do not continuously feed the dog while walking or hiking outside. Walking on a treadmill is more strenuous than walking outside. The treadmill walk does not allow the dog to sniff, read the neighborhood report, and comment on the report. It is continuous movement, so I therefore reduce the amount of time a dog walks outside by one third on the treadmill. For example, if a dog normally walks thirty minutes outside, I will ask them to walk ten minutes to start on the treadmill. If they can do this comfortably, I will incrementally increase their time each three to five days of consecutive activity. An incline on the treadmill will focus more on the hip, stifle (knee) and hock extensors. This is a great exercise for dogs that need more strength and power in the rear. The goal is a slower gait than on the flat to make them focus on controlled movement in the rear. Many treadmills go up to a ten percent incline. A decline will focus on the forelimbs, particularly eccentric control of the forelimbs and hip flexors (iliopsoas). Most treadmills will offer up to a five percent decline. This is a tough exercise to perform and I include it in my end stages of strengthening for dogs with shoulder and hip flexor problems. The things I look for in a treadmill are as follows: proper length of belt, varying speeds (ideally .5 mph to 9 mph), incline, decline (computerized is wonderful! ), safety rails, an emergency stop switch, and ease of handling. Most canine treadmills offer a variety of lengths in the belt. The dog should be able to move into a trot without having to shorten its stride. So it is best to measure the longest reach of the dog, and work with a treadmill from there. For example, a German Shepherd dog may have a reach of up to seven feet. Therefore, the belt should be that long. This is often the problem with using a human treadmill – the belt isn’t long enough to accommodate the stride of a large breed dog. Features such as a bowl for feeding the dog while the treadmill is in motion are in my opinion undesirable. There is the potential for distracting the dog as it walks, causing them to lose focus and slide, stumble or lurch forward after the food in the bowl. In fact, ingesting too much food while performing endurance events can lead to digestive issues. While exercising, the blood of the body is being sent to the peripheral muscles and taken away from the core group. Dogs will therefore have a difficult time digesting while they are exercising. Safety features are paramount. A dog should not be able to fall off the side or leap forward, so I like sturdy panels on each side of the runway and some sort of barrier in front – I use a bungee chord. In addition, a harness system or something similar is advantageous. This keeps the dog in the middle of the treadmill and is often attached to an emergency cut off switch. In case the dog slips backward or forward, the switch will automatically stop the treadmill. A dog should never be left alone on a treadmill, but sometimes accidents happen. I don’t allow dogs to jump on and off the treadmill while it is in motion, as there is too much risk of a paw getting caught or a misstep being taken. I like the treadmills I use to be solid and sturdy, made of a material I know will stand up to consistent use and serious training. Again, my emphasis on quality applies to the equipment you chose for your dog – you should go with the highest quality that fits your needs and budget. Acclimating the dog in a positive manner to a good quality product and using safety precautions is the path to a successful experience for everyone. In Part II, I will discuss specific protocols for strengthening specific areas on the dog. Great article Dr. Debbie, thanks for the useful and practical information! Looking forward to the next article. I like using treadmill as I can control the speed of the dog.